I’ve been a fan of Guy Ben-Ner’s work since first seeing it, about three years ago at what I think was his first Postmaster’s show and with each new video my admiration grows. The latest video that I thoroughly enjoyed is titled “Stealing Beauty” shot entirely at IKEA show rooms with his family. As in his past videos, Ben-Ner works with his kids to create narratives that question or deconstruct elements of our society. As the video proceeds there are traces of rebellion by the daughter, she questions if she is owned by her parents, she demands her freedom and at one point Ben-Ner grounds her. 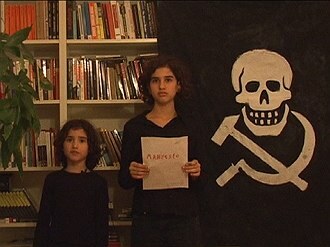 The video concludes with the reading of a Manifesto by the children… “Children of the world unite” calling children to claim what they want, to steal from parents, to claim their free will. 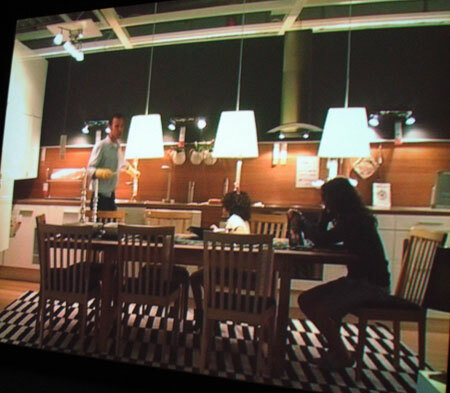 Although the water doesn’t flow from the sinks or shower head and the television and computer aren’t turned on, the family inhabits any number of IKEA show rooms as if everything functioned. They get into the beds, sit at the dinning room or in the living room and play out the script as shoppers walk by. At one point a woman peers into the video camera and pokes at it, someone behind the camera asks her to not touch the camera and re-positions it to focus on the co-opted stage. 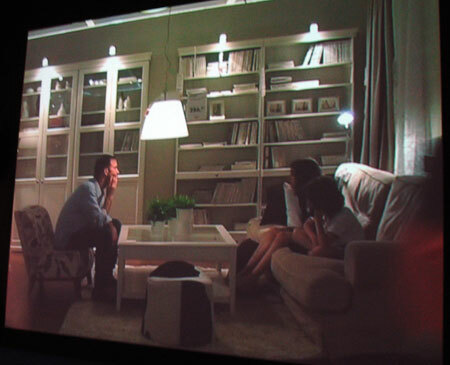 The dialogue doesn’t present any ground breaking ideas, however juxtaposing the script against the sets available at IKEA’s idealized show rooms is brilliant!